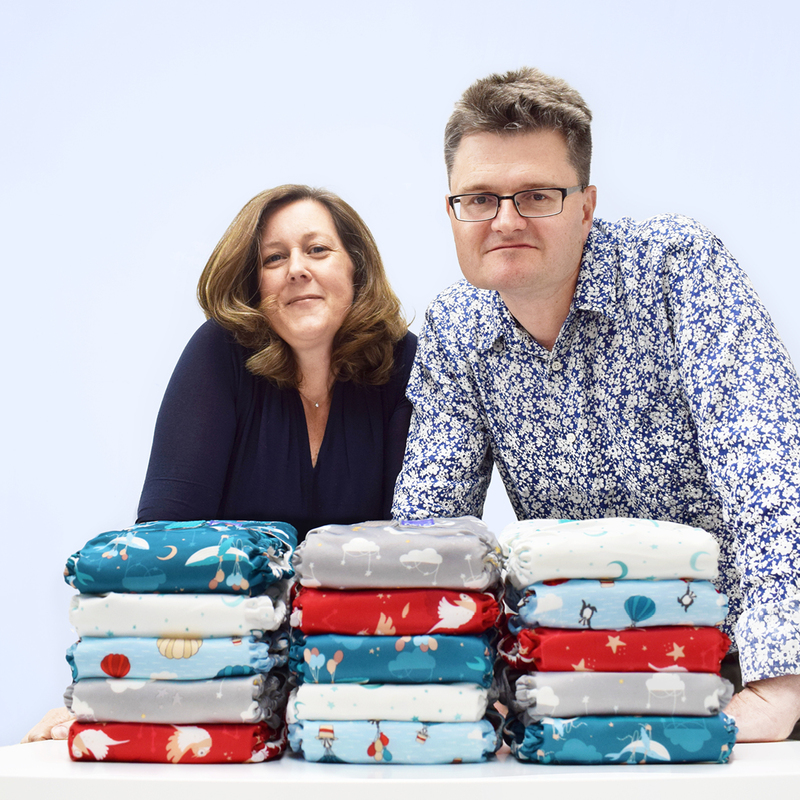 Husband and wife Guy and Jo Schanschieff started leading reusable nappy brand, Bambino Mio from humble beginnings in their home in Northampton. Now 20 years later, their products now available in over 50 countries worldwide and more parents using Bambino Mio products than ever before. The company is growing at a pace faster than ever before. Sales have tripled in the last two years and are forecast to double this year. With the support from Velocity Growth Hub’s ERDF Grant Programme, the company was helped to improve effectiveness and efficiency of their marketing sales system and as a result, their team has grown from 22 to 40. 2018 has been an exciting year for them. Bambino Mio manufactures a multi award-winning range of environmentally friendly baby products including reusable nappies, baby accessories, swim nappies and potty training essentials. These products are growing in popularity and more parents move away from single-use plastic products and towards more environmentally friendly products for their baby. The company now sell their products to major retailers including major UK, US and European Supermarkets. With their rapid growth, it became imperative to have a better understanding of their customers, so they could tailor their brand, products and messaging to the right target audience. Bambino Mio decided to employ an external market research company. This would allow the business to gain valuable knowledge of their audience and their behaviours, without taking staffing resources away from the business. Their objective was to have a better understanding of their audience, to focus their marketing, increase customer engagement and sales. Guy had contacted Velocity growth Hub in the past and when he saw a Velocity Growth Hub advertisement, he got back in touch. Guy spoke to James Stancombe, a Velocity Growth Hub Business Adviser. They met to discuss the finance options available, Guy enrolled Bambino Mio onto the Velocity Growth Hub ERDF project and looked specifically at the Growth Hub programme. Joreen Singh, Marketing Manager at Bambino Mio worked with James to complete the grant application. The application was successful, and Bambino Mio embarked on their research project. The outcome of this project was a great benefit to the company. Their new audience insights supported them to target new customers, leverage existing customers and increase sales significantly. With the increased sales, the company found their current Enterprise Resource Planning software was no longer fit for purpose. The company had two systems in place which were not fully integrated. Again, Bambino Mio knew the rapid growth of the business called on a time for a change. Knowing the financial services that the Growth Hub offered, Guy enquired about the Velocity capital grant. Capital grants are to invest in equipment, machinery, premises or technology to facilitate growth and create jobs. With a successful Capital Grant application, Bambino Mio were able to implement the new Enterprise Resource Planning software within the business. This made order processes faster and increased profitability. Bambino Mio sales have tripled in the last two years and are set to double again this year. Their team has grown from 22 to 40 team members, showing the increasing success of the SME and Bambino Mio look to an exciting 2018 where they will be launching new products and partnering with new retailers all around the world. Any other tips for businesses who many need support? “I would say that the support is out there, so why not go for it. Financial support can completely change your business for the better. Guy Schanschieff, Founder & Managing Director of Bambino Mio.